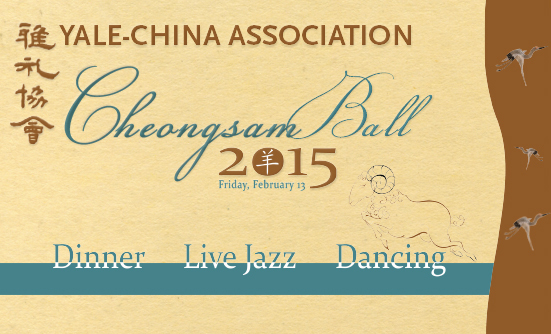 The Yale-China Association will host its annual Cheongsam Ball on February 13, 2015 at the New Haven Lawn Club. In appreciation for Nancy Yao Maasbach’s contributions to Yale-China, we will announce a fund in her honor at the Cheongsam Ball. Join us in celebration, commemoration, and community! Purchase your tickets now at Yale-China’s online store. Tickets are $114 each. Please note the last day to register is February 1. If you are unable to attend but would like to give a gift in honor of Nancy Yao Maasbach, benefiting theJames R. Lilley Memorial Fund, please visit ourdonation page by clicking here. What an evening! A great mix of many generations of Yale Alumni and guests, super food, a great bar, loads of fascinating information on Yale-China’s current work, and fabulous music and dance opportunities. The auction was marvelous and raised lots of money for one of Yale’s premier outreach organization. —Johnson Flucker (YC ’80), participant of Yale-China’s Xiuning Service and Cultural Exchange in China. Yale-China’s Cheongsam Ball is open to all interested parties; tickets and sponsorships may be purchased beginning in mid-December 2014.